The British Army is actively looking for an upgrade for it's Challenger 2 main battle tank (MBT) in order to keep it relevant. The Challenger 2 (CR2) main battle tank (MBT) originally entered service in 1998, after first vehicles for troop and reliability testing were already delivered in 1994, and has seen no major upgrade since then. Compared to the current versions of other tanks (like the Leclerc, Leopard 2 or Abrams), the Challenger 2's performance and design are lackluster in a number of points. In terms of mobility, the CR2 is underpowered thanks to using an old Condor-Perkins V12 engine with a rather low output of only 1200 hp output. This leads to a lower hp per ton ratio than common on other tanks of Western and Eastern origin. While the CR2 is fitted with a rather advanced hydrogas suspension, this is still rather mediocre, because the wheel travel - which determines the suspensions performance in heavy terrain - is only average and by about 10 to 20% smaller than the wheel travel on some other modern tanks. The biggest issue of the Challenger 2 is however the fire control system (FCS). Even the Challenger 2E with improved FCS was not able to compete with the alternatives from France, Germany and the US in the Greek tank trials. Due to being designed as retrofit option to the Challenger 1 and even the Chieftain tank, its FCS is in many design aspects antiquated by more modern standards. Compared to the usual configuration on all other Western tanks, the TOGS-2 thermal imager and the gunner's main sight are two separate units. This causes a number of issues in terms of stabilization (mostly caused by mounting the TOGS-2 on the rather unstable gun) and line-of-sight alignment. When aiming at high elevations, the TOGS-2 won't be able to see the target. While all modern tanks since the 1990s are fitted with a thermal imaging system as part of the independent optronics of the commander, the commander of a Challenger 2 has only a day sight. During operations with low visibility (night operations, dusty/desert environments, etc.) the commander of the CR2 has to fall back to mirroring the image of the gunner's TOGS-2 into his own optics. So currently, the Challenger 2 design does not allow hunter/killer operations during night. The main reason why the British Army demanded an upgrade for the Challenger 2 was the questionable lethality of the L30A1 tank gun. When the Russian Army presented their new T-14 Armata tank, the lackluster penetration of the L30 gun made the British Army worry, wether this weapon is still useful. Unlike pretty much all other modern tanks (bar the Arjun, but this isn't really modern in various aspects), the Challenger 2 uses a rifled gun. This means the gun barrel has grooves at the interior, which leads to two problems: for one, they limit the maximum pressure for autofrettage, which directly affects the maximum operating pressure for tank ammunition - the L30 gun of the Challenger 2 cannot withstand as high pressures as the old Rheinmetall L44 gun from 1979! The second problem of the rifling is the increase of the internal surface by 20-30%, which increases surface friction and thus reduces muzzle velocity. In fact the British Army even considered replacing the Challenger 2 due to the L30A1 gun's poor performance. The L30A1 gun uses three-piece ammunition: the projectile, propellant charge and primer are separate parts, a design decision that affects both lethality and storage options. 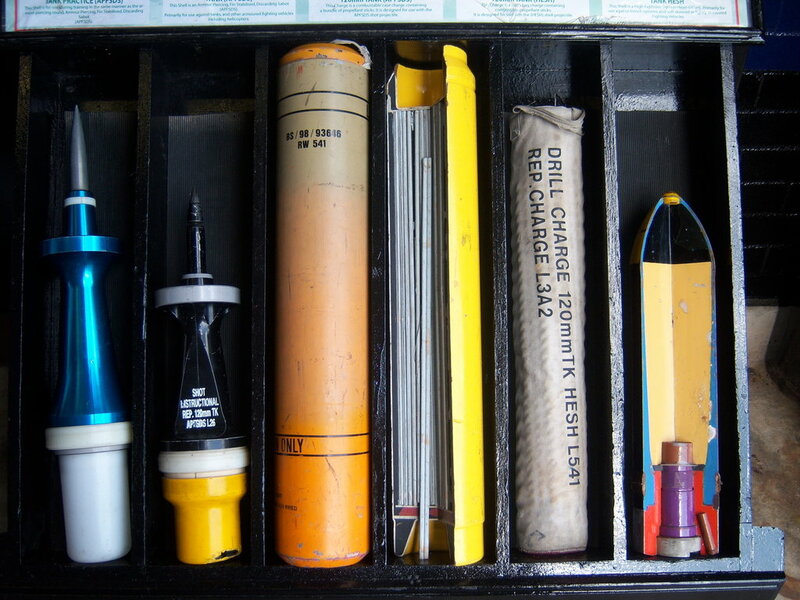 The ammunition stowage of the Challenger 2 is designed to accept only certain types of ammunition parts (propellant charges, primer magazines and projectiles) at certain places (for example all propellant charges are stored within the hull below the turret ring). It is not possible to fit longer or wider ammunition into a CR2, which prevented the upgunning of the Challenger 2 with the German 120 mm L55 smoothbore gun during the Challenger Lethality Improvement Programme (CLIP). It was only possible to create storage for six rounds of unitary 120 x 570 mm NATO ammunition without deeper modifications of the Challenger 2's interior layout. The length limitation imposed by the ammo rack design and location also affects armor penetration with compatible ammunition. In order to improve penetration characterstic, the length of the penetrator has to be increased besides muzzle velocity. This is not an option in the CR2. Last but not least, the rifled gun and the three-piece ammunition design require larger-than-average sabot petals, which increases the parastic mass propelled by the powder and thus lowers armor penetration. General Dynamics, originally an own contender for the Challenger 2 upgrade and considered one of the favorites for being among the two shortlisted companies, decided to withdraw from the competition and not offer an upgrade solution to the British Army. 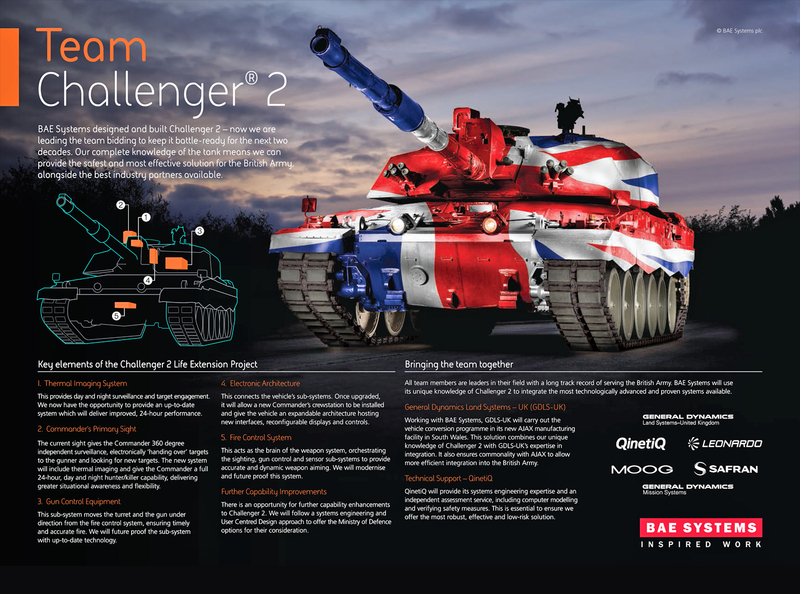 Instead General Dynamics has jointed the Team Challenger 2, which is lead by previous competitor BAE Systems. The Team Challenger 2 consists of BAE Systems, General Dynamics (Land Systems UK & Mission Systems), QinetiQ, Leonardo, MOOG and Safran. The upgrade proposed by Team Challenger 2 is limited to the electronics and optics of the tank only. The thermal imager of the TOGS-2 is replaced with a better model (but apparently still located in the same bad spot at the gun barrel), the commander's primarey sight now also includes a thermal imaging system for day and night operations, while the gun control systems and fire control systems are upgraded/replaced. The proposal from Team Challenger 2 also includes a new electronic architecture for the computer systems of the tank. However the tank is still underpowered, nothing on the drivetrain or powerpack has been changed. It also lacks an active protection system (APS), which is currently in the process of becoming a standard for modern armored fighting vehicles. Let's also not forget about the elephant in the room: a Challenger 2 upgraded according to the proposal of Team Challenger 2 still uses the same old gun as the original tank. The Challenger 2 Life Extension Programme (LEP) was mostly initiated because the CR2 gun and ammunition combo doesn't offer enough performance against the T-14 tank! How can they not try to change it! There is however a glimmer of hope for the CR2. Team Challenger 2 claims that they would like to offer further upgrades and have proposed such - so we might see more. Apparently the British Army is actively looking into the topic of APS, but with a different contract independent of the Challenger 2 upgrade. The CR2 might receive an APS in the future, but this wouldn't be related to the LEP. Also it has been rumored already a few years ago, that the British Army has tested uprating the Challenger 2's V12 engine to about 1500-1600 horsepowers, albeit this supposedly was stopped following a great increase in engine and track wear. A few years ago people like "TanknutDave" on Youtube still argued that the Challenger 2 is the best MBT in the world. They even claimed the fire control system is better than on other MBTs. I get national pride and all that, but at some point you're just making a fool out of yourself and British tank fans did just that for a long time. I always said the Challenger 2 isn't bad, but it is too "as is", with almost no room for upgrades and no growing potential. It is very obvious that the basic design philosophy behind the Leopard 2, making it relatively light weight and giving it lots of excess engine power so you can slap lots of heavy upgrades on the tank without killing its mobility, was definitely the better way to go. I guess you can't blame the British engineers too much. At the time when they designed the Challenger 2, they probably still thought they would be designing a successor soon and didn't know that the Challenger 2 would have to remain in service so long and might even end up being the last big and heavy MBT designed in the UK. On the other hand, I think you didn't need to be a clairvoyant genius to see that sticking with a rifled gun and a fire control system that has no hunter-killer-ability at night was dumb and shortsighted at the time they designed the Challenger 2. Somebody definitely can be blamed for that. As I said, I always said the Challenger 2 wasn't bad, but to be honest, the more I learn about it (like for example that the legendary Chobham armor is really nothing else than a spaced sandwich armor that does almost nothing to stop sabot KE projectiles but is only useful against HEAT, almost like cage armor), the more I think I have to change my opinion and admit that the Challenger 2 really is a bad tank. Chobham has undergone upgrades and composition changes every 5-10 years since the 1970s. The Challenger 2 will be replaced, but not by the hypothetical Leopard 3 or Euro Leopard. It'll still be a British tank, as the UK still wants to keep some vestiges of its defense industry alive. However, General Dynamics or Lockheed will probably end up doing a large art of the design work on it. I found your blog a couple of months ago, and I really enjoy reading your articles. Well done! I have a couple of questions about the Challenger 2, and maybe you can provide more details. As you said, the TOGS-2 thermal imager and the gunner's main sight are two separate units. As I understand, the image from the thermal is supplied to the gunner and commander monitors. The thermal camera is placed on top of the gun to get stabilization, but no ballistic solution is provided as the gunner's main sight is independent. Is this the case? IIRC the attempts to integrate Rheinmetall 120mm were cancelled due to cost. I had not read about the issues with ammunition storage but I am not surprised. You also said that the British Army considered retiring the Challenger 2 due to it's gun. Do you know when this was considered? After the end of the Cold War there was not much pressure on tank improvement. I worked on Challenger 2 from early pre prototype through to 2010 as part of the trails and development team. At the Greek trials only Leo outperformed Chally; I know, I was there, were you? M1A2 and Chally were gunnerywise pretty even. Leclerc completely lost the plot when the auto loader failed more than once. T80 was a disaster with slow burn that could have had serious consequences for the crew. The sandwich you refer to is more effective against KE than you suggest: agreed not infallible but better than most: I know, been there seen it and done it! As with food it is all about presentation-enough said, I will say no more for obvious reasons. Incidentally. we used to deride Leclerc as a turret that was one big ballistic window! On the subject of DU, yes well Leo may have higher pressures etc but tungsten will never match DU for penetration and I can never see the German military ever being allowed to go down the DU route! Re the challenger 2. Wikipedia states 408 were delivered but only 227 are in use. What happened to the surplus tanks? It's not just the fire control but the munitions compatibility. Right now, the Russians out gun us with SLRP, beyond 2,700m. By 3,500m there is not enough energy on the round to be ballistically consistent in either precision or penetration. The Russians compensate for this, out to 6,000m, with the Refleks and the new Komet CLGP. The Germans have LAHAT. And while these are functionally closer to tube launched ATGM (i.e. subsonic, slow, beam riders) they still beat the best of our precision sight technology lead (QWIP-3 and SFPA) by simply outranging us. Is this important? It is in the desert. It would be on the Ukrainian steppe. In the forests of Eastern Poland or the Baltic states? However; at ranges under 1,000m the Dorchester and DU don't reliably stop KEPs and under 500m it's a quick draw match which means fighting tanks in builtups is also a dead even heat (and beam rider CLGP plus APS offer nothing to change this...). Where we NEED TO GO is towards NLOS brilliant munitions like the XM1111 so that we stop hitting the rhino on the forehead (frontal arc MBT protection is enormous) with a jeweler's hammer and start dropping a hand grenade in it's ear (top attack with EFP/HEAT to defeat APS and glacis protection). This would give us first round guarantees of lethality performance with a simple mod to the XM1069 (AMP) warhead to include earth stabilizing spoiler deployment and a timed profiler fuse set by the ADL as the round leaves the barrel. Such a round leaves the barrel as 3,500-4,000fps vs. about 880fps for the CLGP which means you will -win- the time of flight contest at extended ranges as the tank has to provide an extended laser illumination cone. Where, once sabot drops below about 2,000fps, the chances of frontal penetration go down as the ballistic scatter goes up, the HEAT round doesn't care. Past this, we need an ability, similar to the FCA drone carrier, to launch multiple endurance MAVs on a rocket to 20-30km downrange so that we can target over the horizon and thus start to move towards NLOS with systems like the XM1111. This 'Just like Custer did it!' approach to dealing with Indians using breached rifles at whites of eyeball ranges is just silly. Especially as it effects your ability to deploy a THEATER MOBILE force, rapidly, to a conflict zone where heavy MBT are already present (i.e. M8 Buford vs. T-90a...) and given that tanks don't survive well in cities but could easily lob-shot either GPS or brilliant rounds over buildings, simply by cardinal point enveloping a city as infantry advanced from both within (airmobile) and without (IFV and UGCV). Tanks were not invented to kill other tanks. They have become specialists in that arena but that very specialization has limited (gun super elevation) rather than enhanced (all round armor packages kill mobility and still don't protect against roof shooters) their original, WWI, intent to move the infantry rapidly through no man's lands by breaching or reducing obstacles. There are ways to deal with tanks that make the whole concept of muzzle energy by ever higher operating pressures and round velocities (currently up around 1,800fps) out of date. If we can punch 200mm roof armor or better yet _pick aimpoints_ like 100mm GPS apertures and crew hatches, we _don't need_ 120mm or better rounds and in fact can move back towards 105mm with the attendant advantage of a 60-70rd onboard ammunition stowage condition vice the 40-45 rounds of the almost unhandleable (too heavy) M829/830. With systems like BAe's 'Adaptiv' Peltier thermal cloak we also have the countermeasure as an ability to go NLOS at the same time we deny the competitor threat the option to simply copy us in one arena with seekered rounds. Read up about how the fighting in Ukraine is consuming hundreds of MAVs to the point where both sides are using 3D printing technology to duplicate commercial designs in cuing massive artillery fires (division level tubes firing at company level frontages with 250-300 rounds per tube) and you will realize how important it is to move to NLOS while keeping our tanks non white dotted to thermal systems as 'get seen, get dead' elements of maneuver as approach to contested areas which far outweigh the conventional considerations of mobility, protection and firepower. We need to be more forwards thinking. Hi! Do you know the length of the propellant charge bags?